Bennett Gordon Hall is located in the John D. Harza Building, at the southwest corner of Ravinia, near the south gate. Parking: For those attending a BGH Classics Series concert, parking is free in Ravinia's south parking lot, clearly marked in the map above. 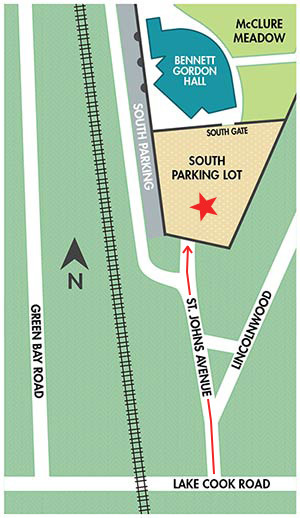 Note: The west parking Lot (Green Bay Road entrance) is not open for BGH Classics concerts. Directions: From the intersection of Lake Cook and Green Bay Roads, travel east on Lake Cook Road. Cross over the railroad tracks and immediately turn left onto St. Johns Avenue (north). When the road splits, keep to the left; St. Johns will lead directly to Ravinia’s South Parking Lot. Lake Cook Road will be closed east of Green Bay Road and west of St. Johns Ave for railroad repairs at the Braeside station crossing from Oct. 10 through Oct. 19. Please plan ahead as this closure could impact your route to Ravinia. Railroad officials report that trains will not stop at Braeside station late evening on weekdays or on the weekend. Click for detour info.